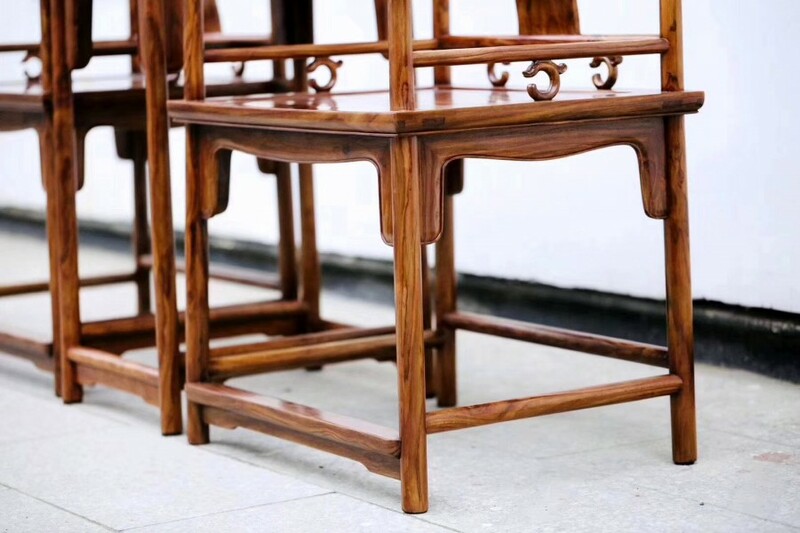 Feature：Chinese classical style. A end table and two southern official hat arm-chairs(1*). Chairs size 48x60x90cm. Dalbergia odorifera T.Chen(2*), mortise and tenon (3*). 1* The ‘official’s hat chair’ is divided into two categories: the yokeback armchair (with four protruding ends) and southern official’s armchair. 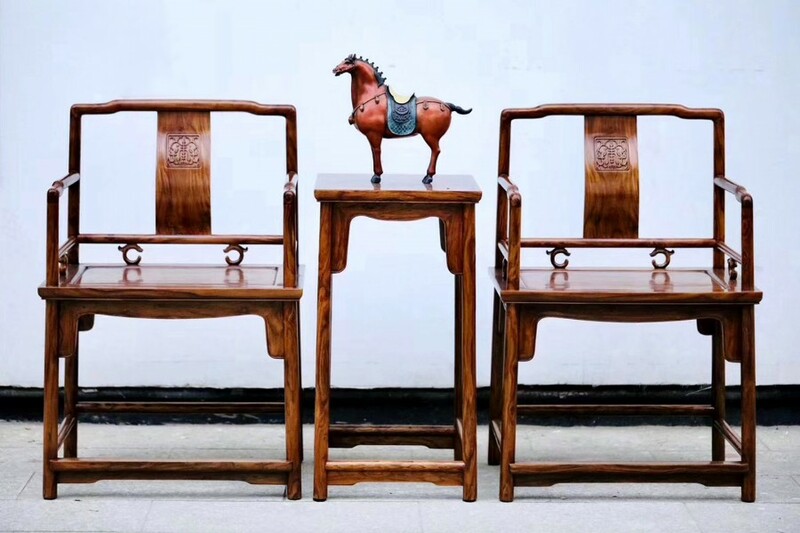 Of these, the ‘yokeback’ chair or is perhaps foremost amongst the various traditional Ming-style chair forms, exhibiting dignity and poise. It is a formal chair, and frequently appears in hierarchical seating arrangements.Fine examples of yokeback chairs are sculpted with dynamic and vigorous lines, and exhibit an upright stance with sinuously shaped posts and armrests. The backsplats are generally of S-shape. 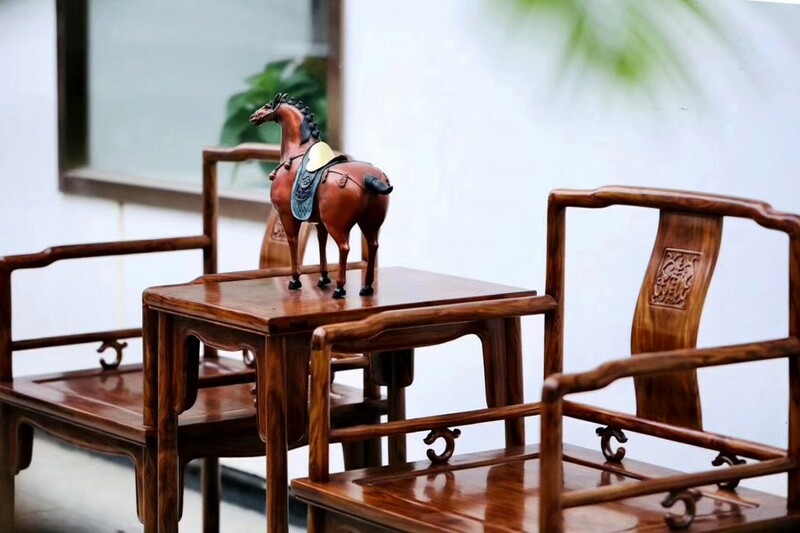 They may be made from a solid piece of wood or comprised with several panels that are sometimes pierced or carved with ruyi or other decorative motifs. 2* Dalbergia odorifera, or fragrant rosewood is endemic to China and occurs in Fujian, Hainan, Zhejiang, and Guangdong. It is used as a wood product and in folk medicine. 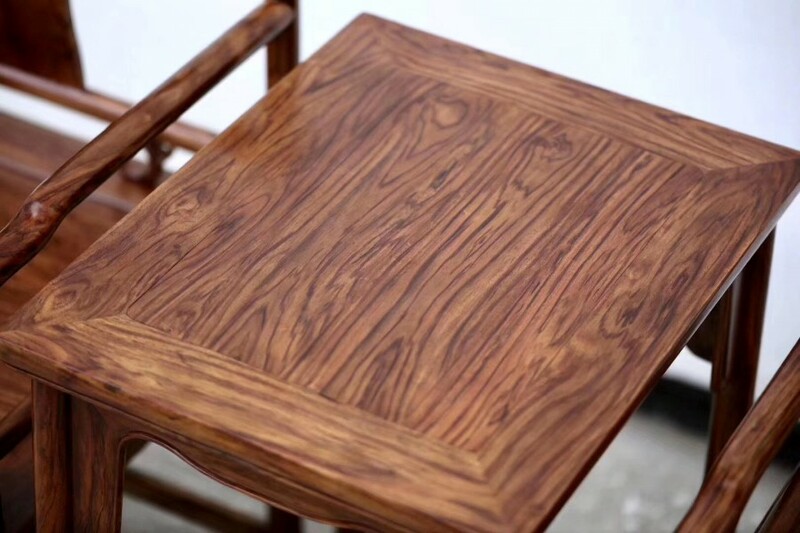 This valuable wood is known in China as Huali and Huanghuali. 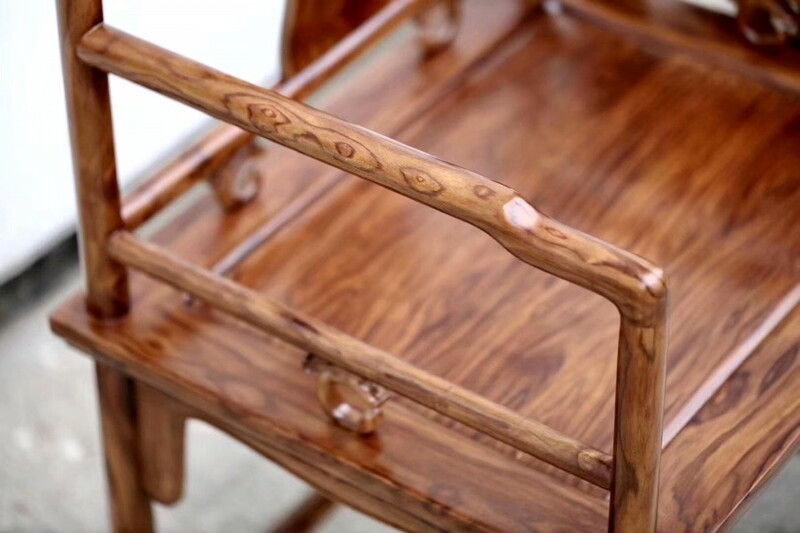 Higher quality furniture from the late Ming and early Qing dynasties were made of this wood. 3* The mortise and tenon joint has been used for thousands of years by woodworkers around the world to join pieces of wood, mainly when the adjoining pieces connect at an angle of 90°. In its basic form it is both simple and strong. This is an ancient joint dating back 7,000 years. 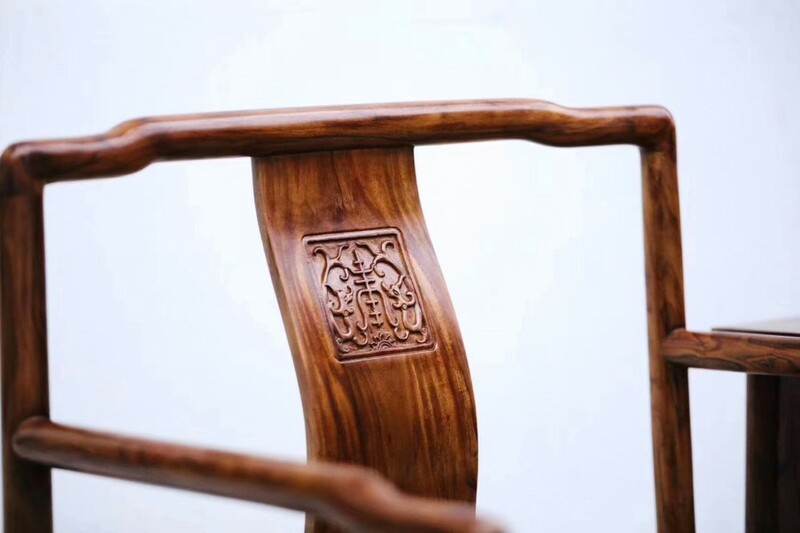 In traditional Chinese architecture, wood components, such as beams, brackets, roof frames and struts, were made to interlock with perfect fit, without using fasteners or glues, enabling the wood to expand and contract according to humidity. Archaeological evidence from Chinese sites shows that, by the end of the Neolithic, mortise-and-tenon joinery was employed in Chinese construction.